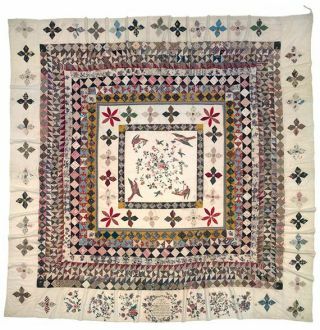 How excited am I that the Quilts from the V and A Museum in London are coming to the Queensland Art Gallery, Brisbane. The exhibition runs 15th June – 22nd Sept 2013. Tickets and information can be found here. Gather your quilting friends and travel into Brisbane city for a most memorable exhibition. Watch these fabulous videos on the quilts here at GAQOMA TV. 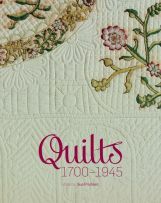 To co-incide with the exhibition, a publication has been released that celebrates over 200 years of British quilts. The book can be purchased on-line here or at the QAG book shop. Also, check out the fabrics inspired from the Victoria Albert Quilt collections. The V and A fabric shop have some great projects using their fabrics. Don't miss the exhibition. It was fantastic in London. I love every minute I spent in V&A. How wonderful for you all. Like Anne-Mettes, I was lucky enough to see the exhibition at the V&A and wished I'd been able to go again. I am definitely planning a trip up to Brissie to see this – I just bought the latest Down Under quilts magazine which has a feature on the Rajah quilt in it too. Ooh lucky you. Wish I could make it to Brisbane. I'm flying up for a weekend with a group of quilter friends to see the exhibition. It's so great that the exhibition has come to our shores. Can't wait to see all those gorgeous quilts. I am planning to go, after the school holidays! I was lucky enough to see this exhibition in London, the most surprising was the fabric by Grayson Perry, I was underwhelmed by the piece by Tracy Emin. There was so much to see in between, enjoy!